Kinn MKE Guesthouse. Welcome Home.. The boutique hotel Kinn Guesthouse in the heart of Bay View is inspired by community. Kinn’s individually designed suites are brought together by a chic lounge for gathering and a state-of-the-art kitchen where guests can prepare their own creations. The owners of Kinn, a family with generations of hospitality experience, gave Peabody’s design team a distinct objective: for Kinn to have a collected, eclectic, and youthful spirit and for visitors to feel this is “their home away from home”. Tami Stephens and the Peabody’s team achieved this by curating a mix of furnishings emphasizing fun shapes and metallic accents with highlights of bold color. They combined textures from plush bedding, chunky knits, fluffy stools, to leather and woven wicker. 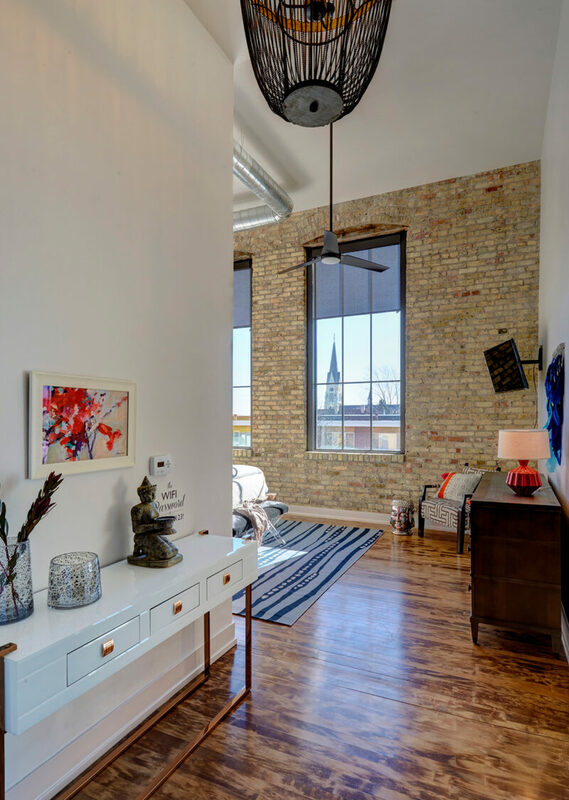 Fresh fixtures and striking finishes highlight the original cream city brick walls and wood floors.